With spring fast approaching (although not really fast enough) I wanted to make a blanket cozy enough for the end of winter, but also light enough to go with my spring and summer decor. I decided a combination of linen and flannel would be perfect together. 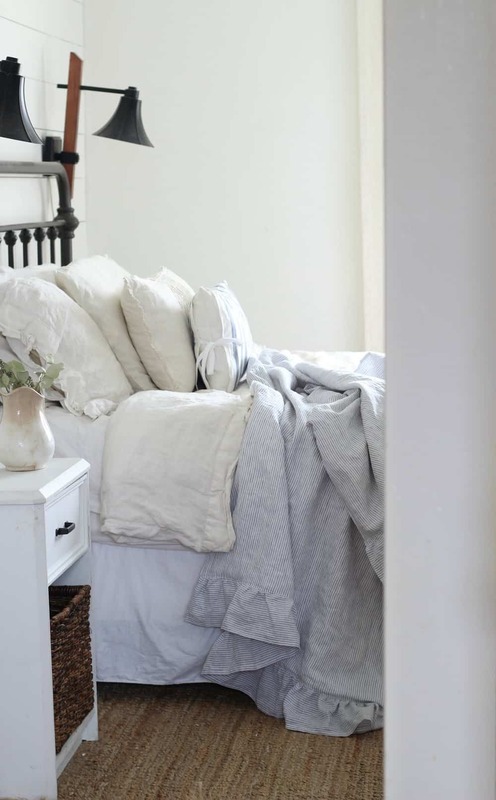 I love the soft look of 100% linen and how it drapes so beautifully across a bed or chair. And flannel is, of course, cozy. 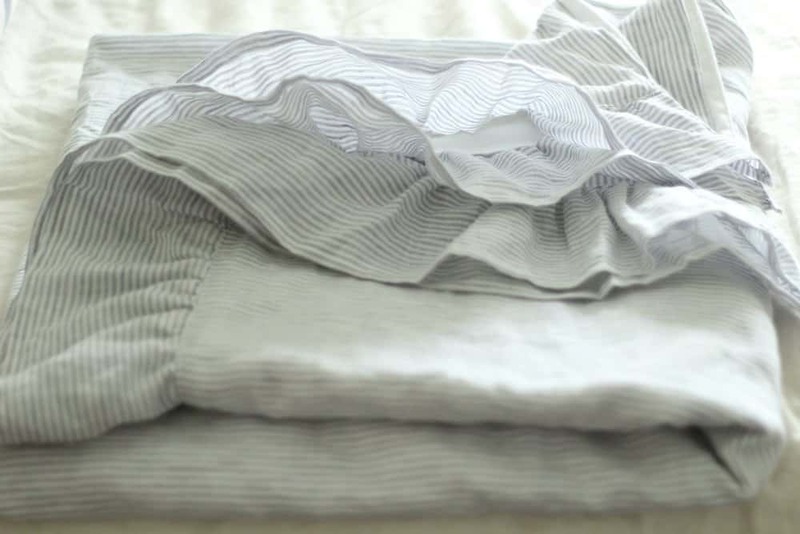 For this project I project I bought three yards each of this striped linen fabric and this white flannel. 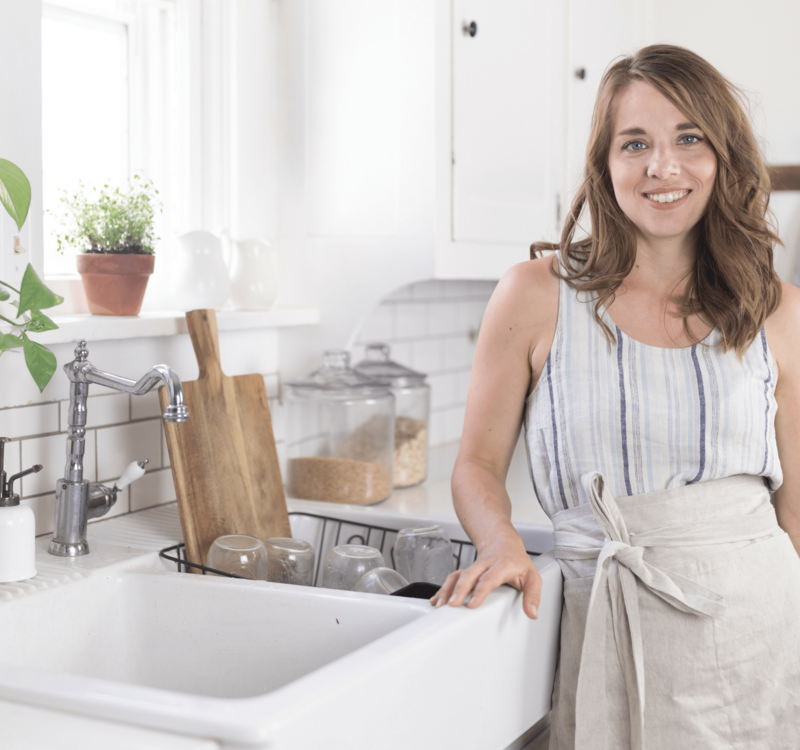 Since two yards measures 72″ inches in length, you can definitely get by just fine with two yards. 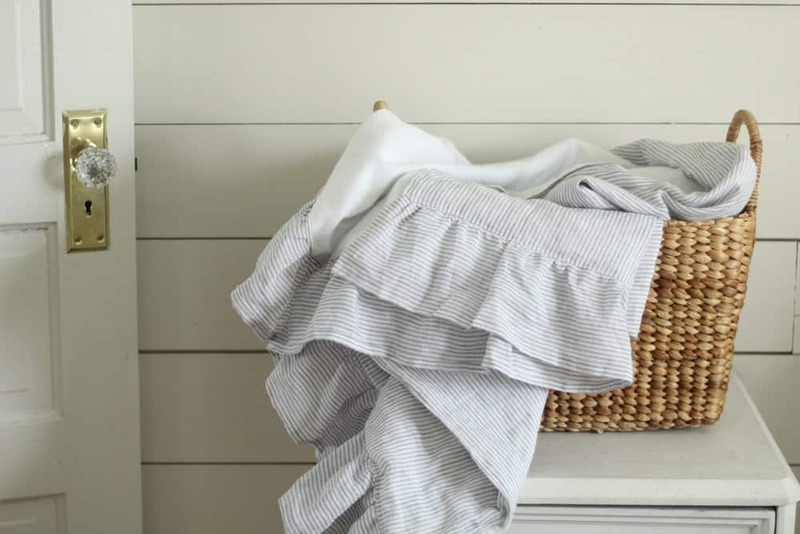 You could also make this project for a lot cheaper by purchasing plain old cotton, but I love the lightweight drape of this 100% linen. 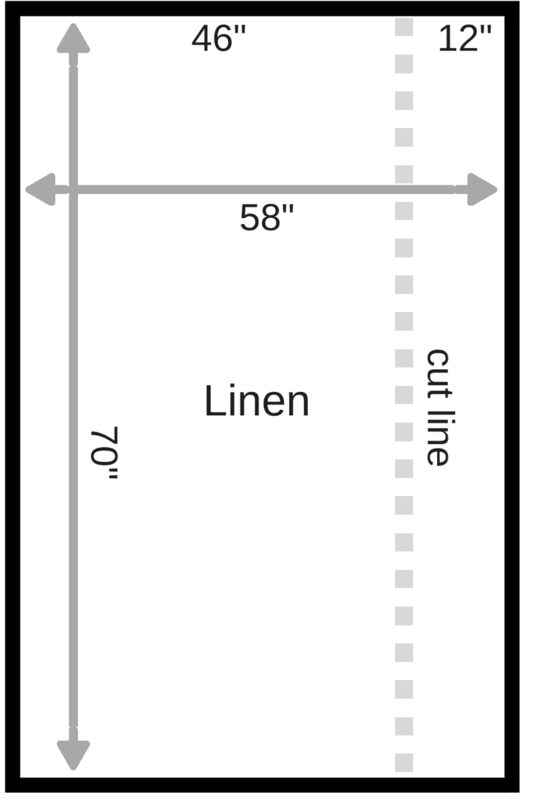 The linen fabric is 58″ wide, so you will have a 12″ by 70″ strip left after cutting your 46″ by 70″ piece. 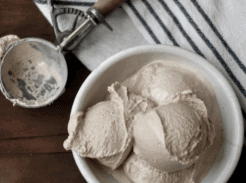 Cut that long leftover piece in half down the middle and you will have your two ruffle pieces. So, first things first. 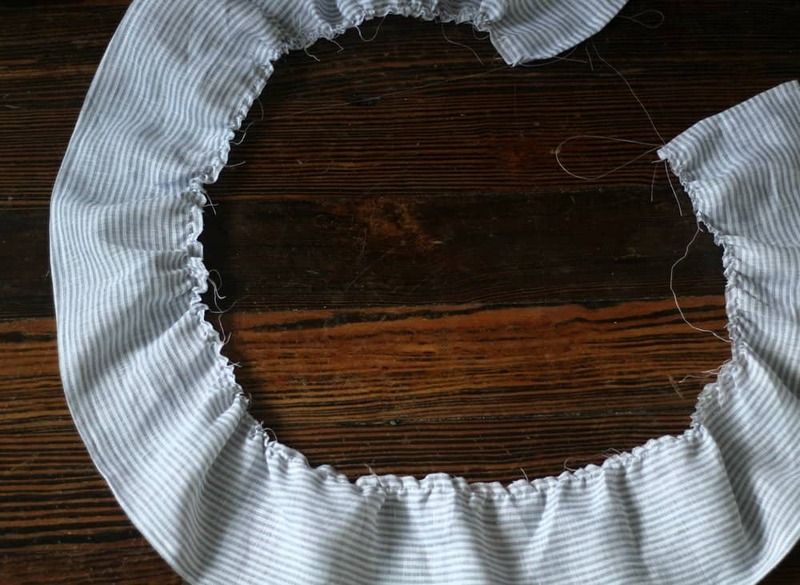 I pressed the long side of one of the ruffle pieces down 1/4″. Next, to hide that raw edge inside, I pressed it down again another 1/4″. I then sewed that seam down for the entire length of the long side of the ruffle piece. Next, I pressed both short ends over 1/4″, and then another 1/4″, to hide the raw edges inside. 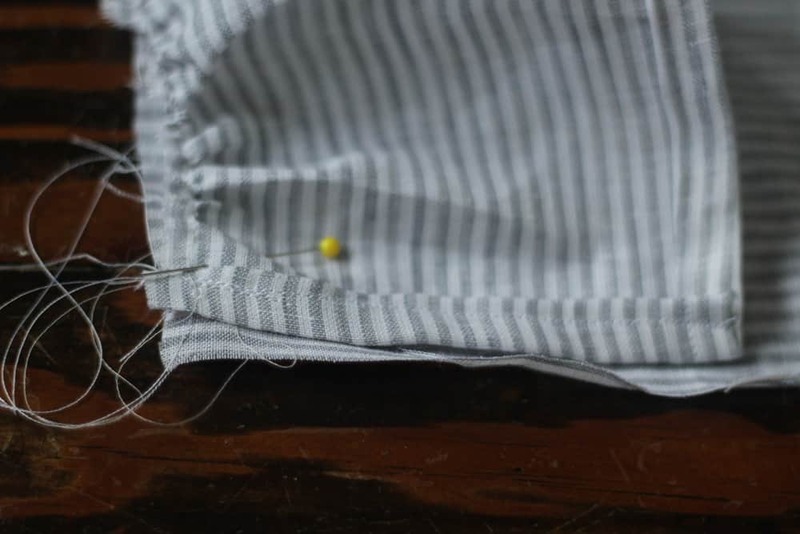 I sewed the seams down on both short ends, so I had three of the four edges hemmed. Next, I put a gathering stitch* in the long side of the ruffle piece that wasn’t hemmed. 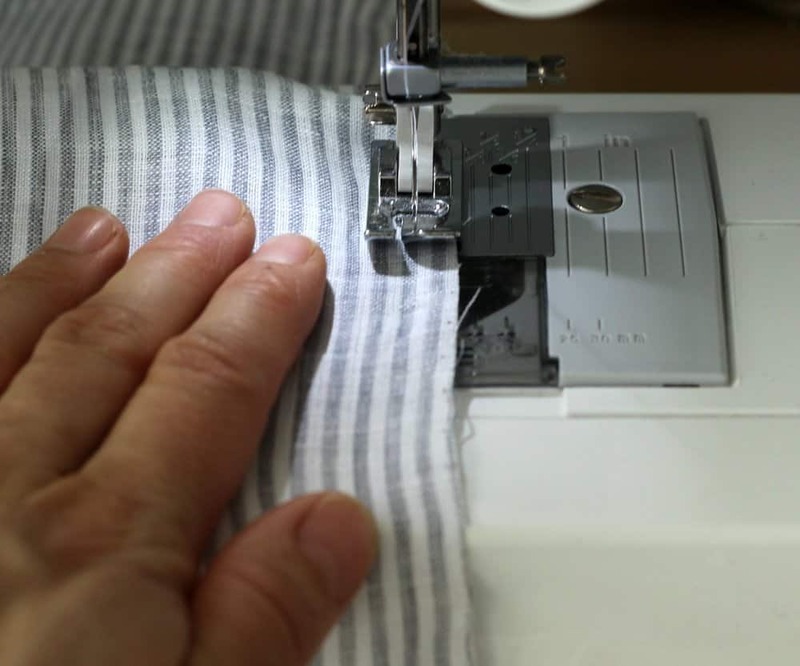 *A gathering stitch is just sewing down the length of the fabric with the longest stitch that my machine allows. Since the stitch is long, it will be loose enough to allow me to pull them, and create the ruffles. 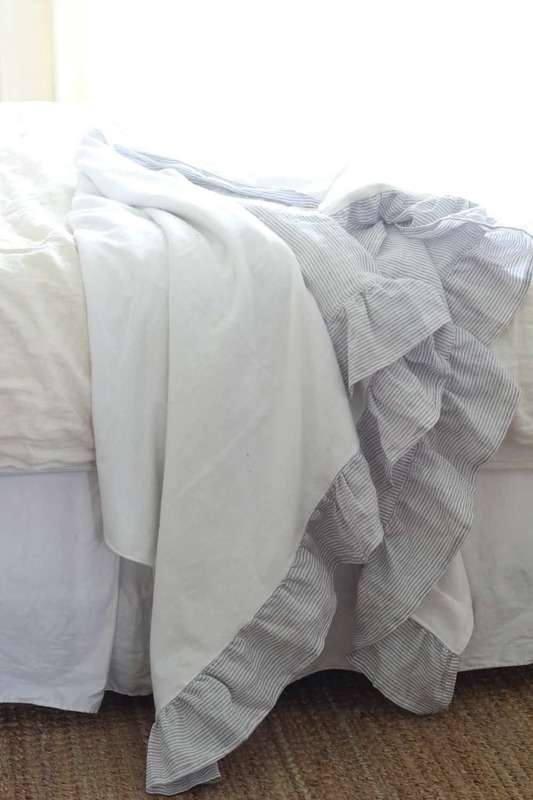 I tugged the strings gently from both ends to create a 46″ ruffle, the length of the short end of my large linen piece. Set the tension on your machine to as high as it will go. 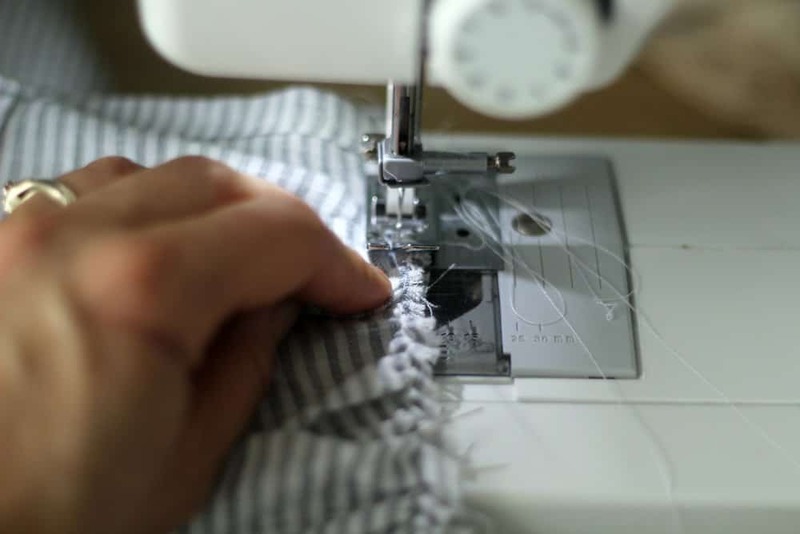 The combination of the high tension and loose gathering stitch will cause your machine to pull the fabric and create perfect ruffles, without any effort on your part. Just make sure to set the stitch length and tension back to normal before actually sewing your ruffle onto your main piece. 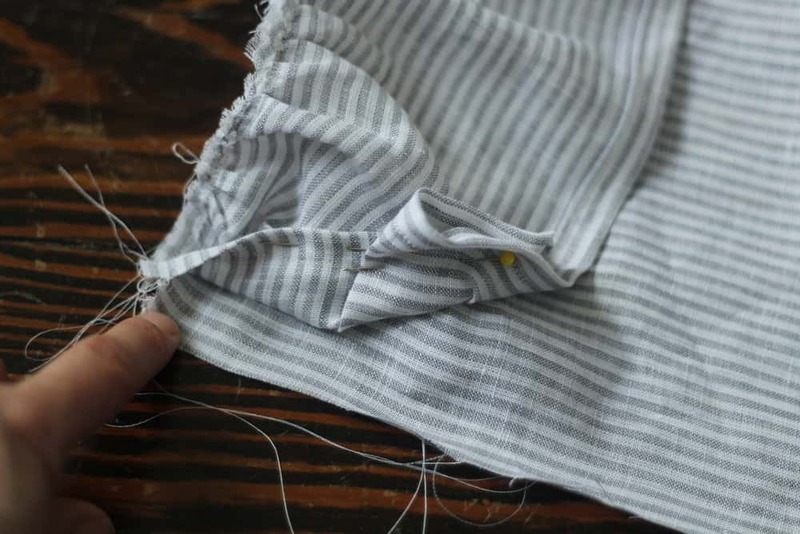 When sewing ruffles to your main piece that you are working on, make sure to sew as close to the gathering stitch as possible, to keep the ruffle looking nice. 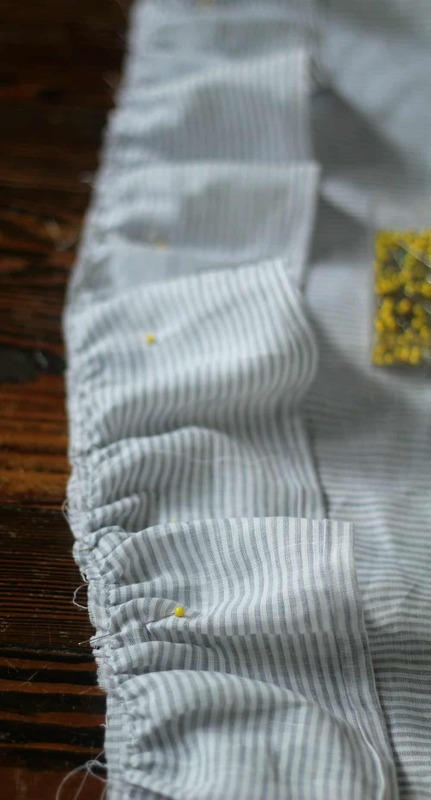 The rule of thumb for cutting a ruffle piece is one and half times the length of the piece you will be attaching it to. So, for example, if you want to sew a ruffle onto a 10″ piece of fabric, you should cut your ruffle piece to 15″ in length. I made sure to pin the ruffle at least 1/4″ away from the edge of the fabric. I will need that extra space to sew the flannel to, later in the tutorial. Just be sure to leave 1/4″ on each side. 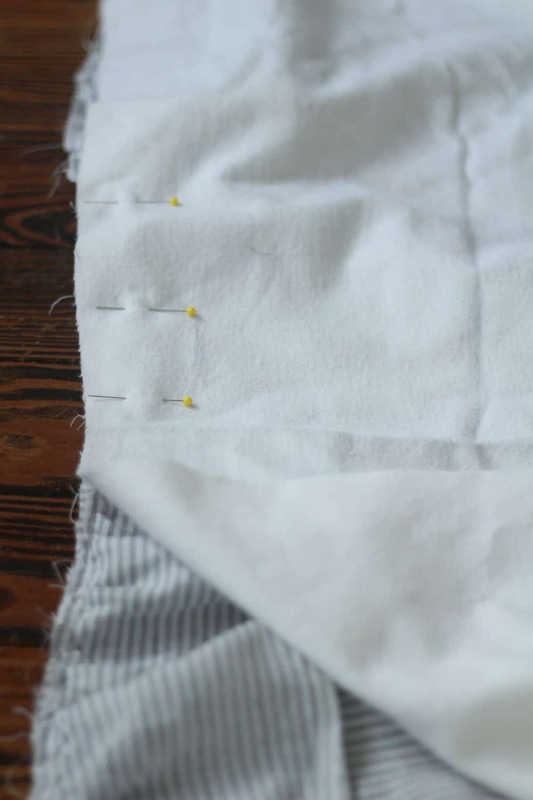 Next, I sewed the ruffle to the 46″ end of my linen, being careful to sew closely to the gathering stitch, to keep my ruffles looking nice. And this is how the ruffle looked all sewn on. 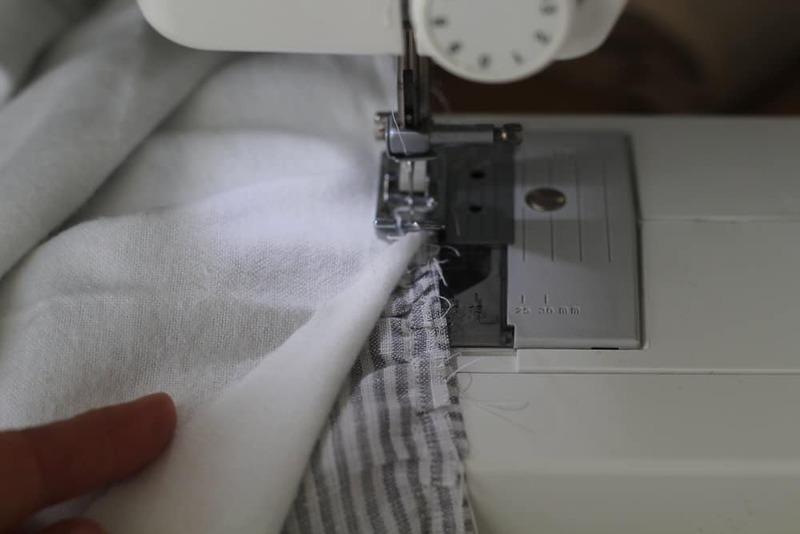 Next, I repeated the whole process to sew the other ruffle onto the other 46″ end of the linen fabric piece. 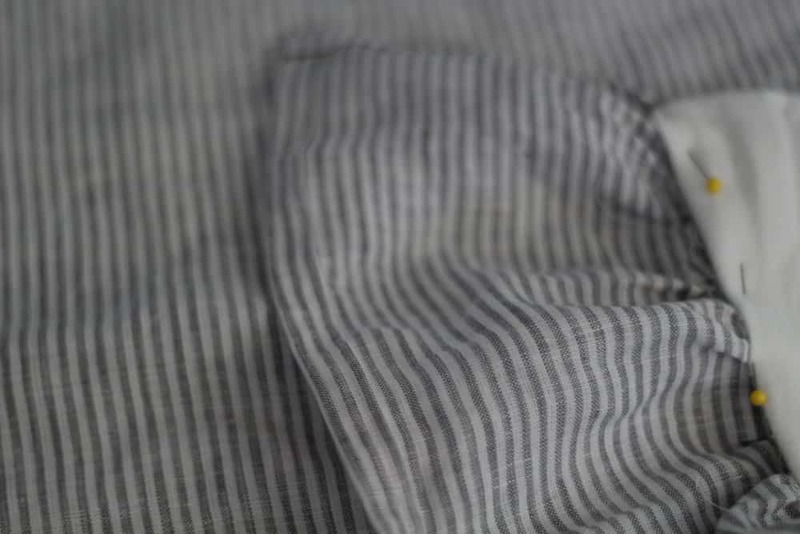 After that, it was finally time to sew the flannel to the linen. To keep the ruffles away from the edges while sewing, I folded them over, and placed a few pins to keep them there. Next, with the linen piece on the floor with the right side facing up and the ruffles facing down, I laid the flannel piece on top. It was basically a linen, ruffle and flannel sandwich. I pinned the whole thing all the way around. Then, I sewed around the entire thing, being sure to not sew too far away from my original ruffle stitch, to keep my ruffles from getting wonky. I made sure to leave several inches not sewn at the end, so I could turn the blanket out, and hide all the seams inside. To close up the spot that I left not sewn, I folded the flannel under and pinned it in place, making sure to keep the ruffle edge tucked inside. I sewed that spot closed. Then, I top stitched* around the entire blanket. 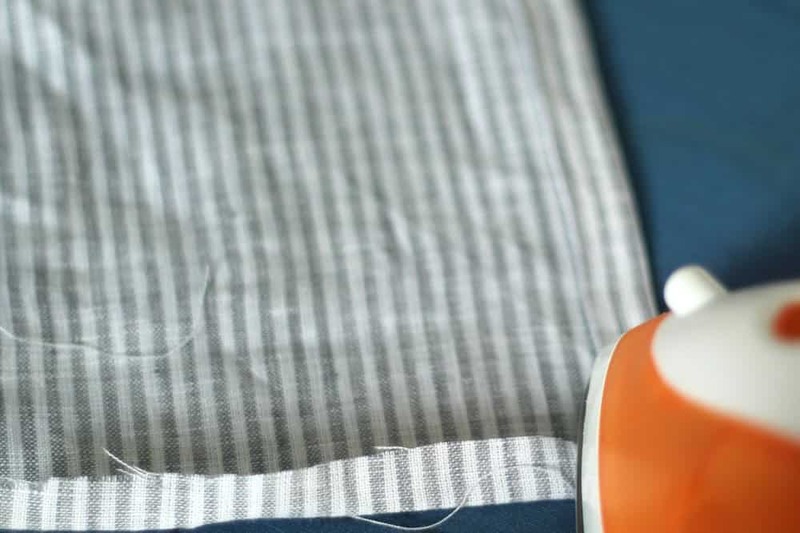 A top stitch is just a stitch sewn close to the edge all the way around. It is “on top” so it will be seen in the finished product. 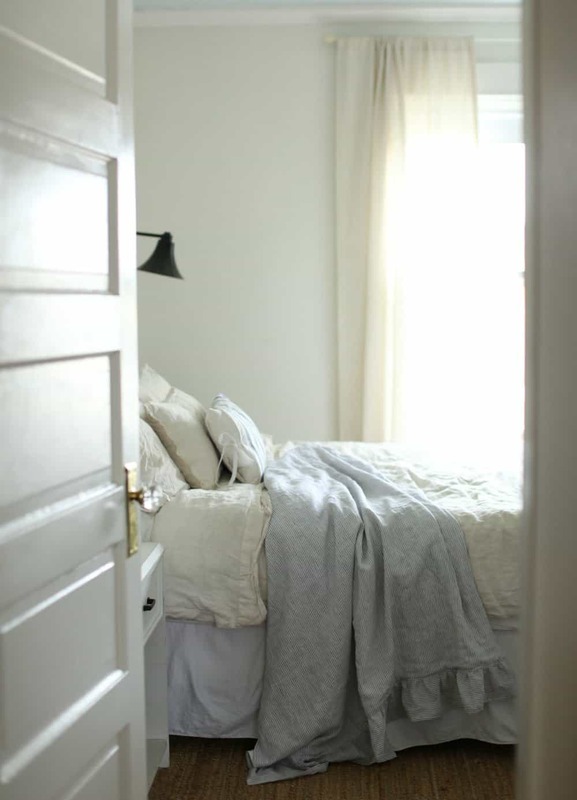 The flannel makes it so cozy and warm and I love the subtle gray color of the linen. It looks so beautiful paired with ruffles. I have always been a ruffles girl. When my girls were smaller, I was able to get away with putting three or four layers of ruffles on their dresses and skirts. Two baby boys later, and it has been a while since I have had an excuse to sew ruffles. 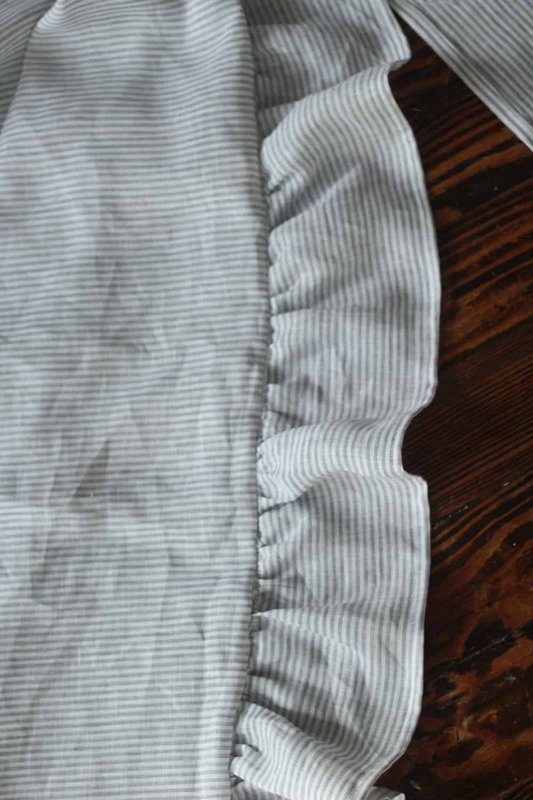 Turns out linen is the best material ever to sew ruffles with. They just drape so beautifully. I hope you try this blanket out for yourself. It was super simple to make. Now I want one for every room! 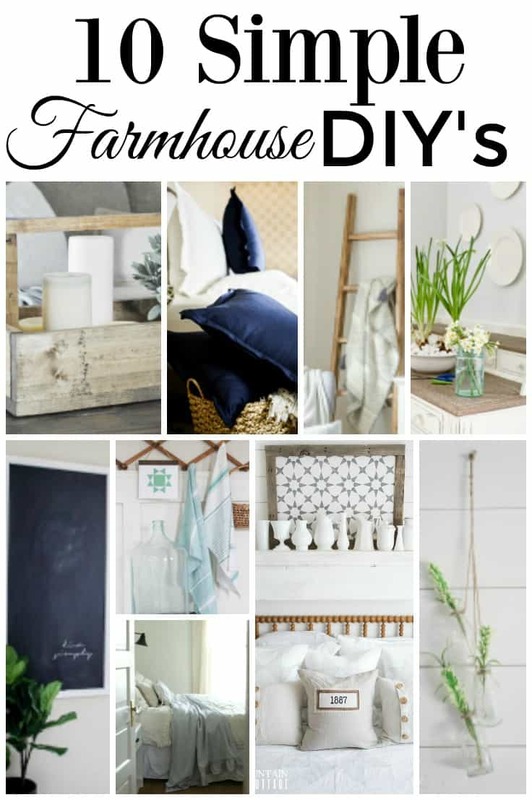 I have teamed up with nine other bloggers to bring you 10 Simple Farmhouse DIY’s. 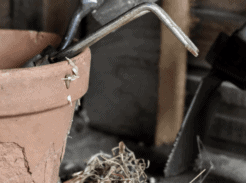 These are all amazing projects that you could make for your own home. This post contains affiliate links. Get my full disclosure here. Oh this is lovely! Thanks for sharing such a great tutorial. I want to go fabric shopping pronto! Yay! Let me know if you try it! Very nice! Looks warm and cozy. Its lovely!! Can I just buy it from you?? That is what everyone keeps asking! LOL Guess I need to list them in the shop! 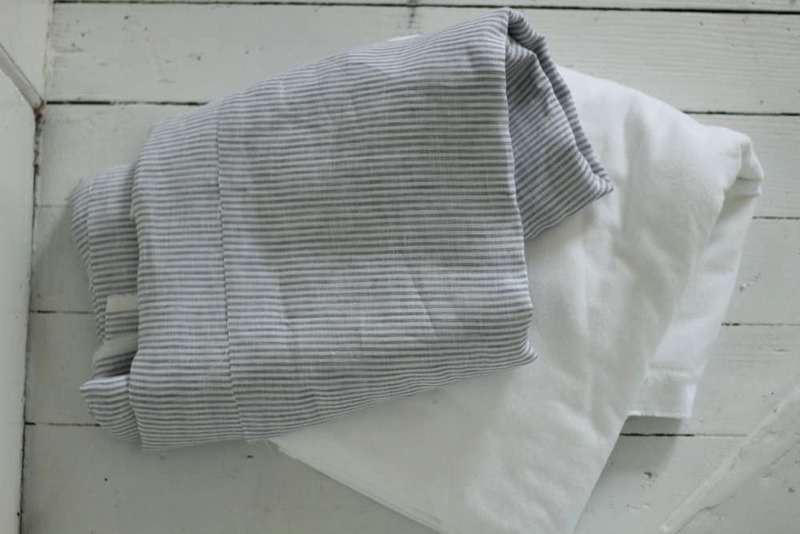 I absolutely love this cute dainty throw. I have that white pillow from IKEA and the throw looks so good with that and your diy tea towel pillow cover. Do you ever take special orders to make for us viewers? Your work is amazing! I am considering it, because I have had so many ask about me making it. Thank you so much! I agree you should sell these. They are adorable. 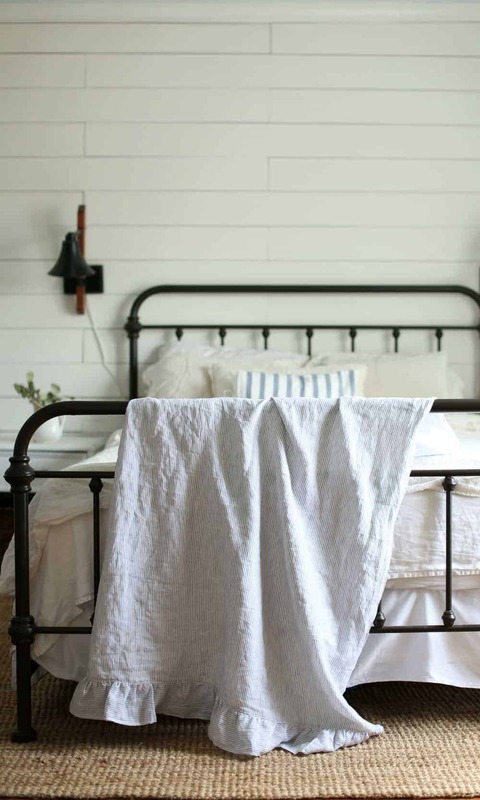 Have you mentioned before where you purchased your linen bedding from? I love the looks of your bed – so comfy! Adorable addition to your dreamy bed. Thanks so much for the easy to follow instructions you’ve included in your post. I plan on making this as I’ve ordered my fabric just now. Hopefully mine will look this good!!! I love this but don’t sew. Could I possibly talk u into to making One for me. I’ll pay for it of course! Love this! Is there a ruffle in just one of the short ends? Hi, this is super pretty, and looks full of warmth. I just acquired a sewing machine and even though I did do Home Economics in school, it was more years ago than I care to share LOL. I was wondering if you would be willing to email me the pattern. I can’t figure out how to save this page in the favorites… I only have a phone, have not set up my computer… ? Thank you so much!!! Also, I think you could make a really cute holiday blanket from this pattern. Love this throw! It’s times like this I wish I could sew. Are you, by chance, thinking of selling these in your Etsy shop? Amazing! I just prewashed my linen and flannel that i bought ago last night! On it today! Love everything about your blog! Lovely, thanks for the directions! Ok so I know its been said &asked…. But I think this would be a wonderful addition to your Linen pillow covers that you sell & I know both myself & many other followers would purchase this to go with the pillow shams you currently sell on Etsy. I went to go buy a few of the pillow shams & only wish to say they are a bit more expensive than I had anticipated. Sorry, but there’s just so much linen bedding & pillow shams & cover’s on Etsy now that I just didn’t expect your price for yours. If possible just maybe look & see if its feasible to lower a bit. You have many follower & many that want those & NOW this wonderful throw, that I know I would purchase all at the right price. Either way I absolutely LOVE this ruffled throw!!! And YES want one or more as well. Thanks & God bless, Lori K.
As a seamstress, I get asked to do things for free or to do alterations cheaper than what I charge. The issue in your comment is obviously you haven’t priced quality linen fabric and asking to lower her prices is disrespectful to her talents, time, and business. Do you question or ask a lower price for services from a doctor, lawyer, etc.? Hi I am ready to start this ruffle blanket but all the flannel I find is 42”. And your link brings me to flannel that is 45”. Any advice? 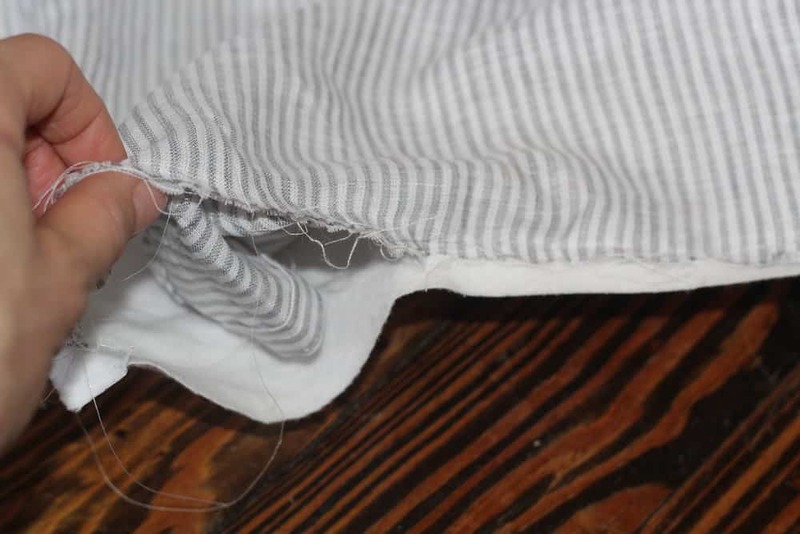 This is a silly question I know but… does your throw have ruffles on the end or just the sides? Thanks for this tutorial!! Can’t wait to try it out!! I don’t *need* one more throw but this one is ADORABLE! 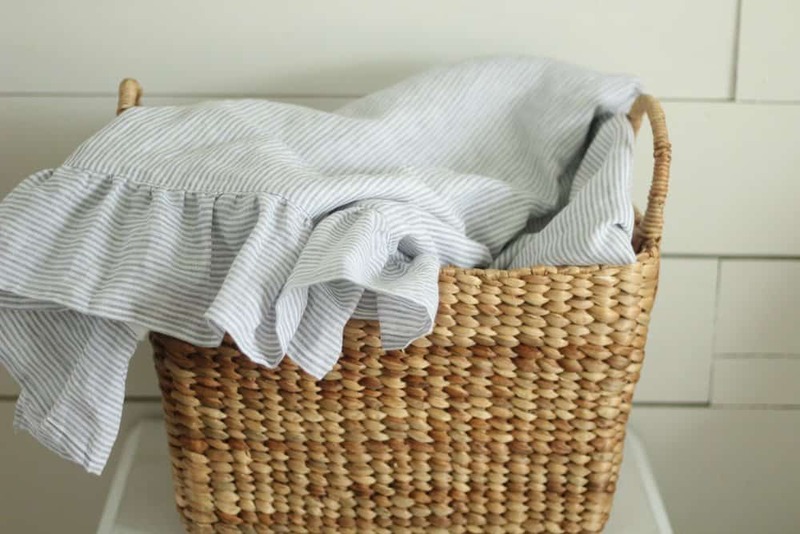 Did you wash your fabric first?